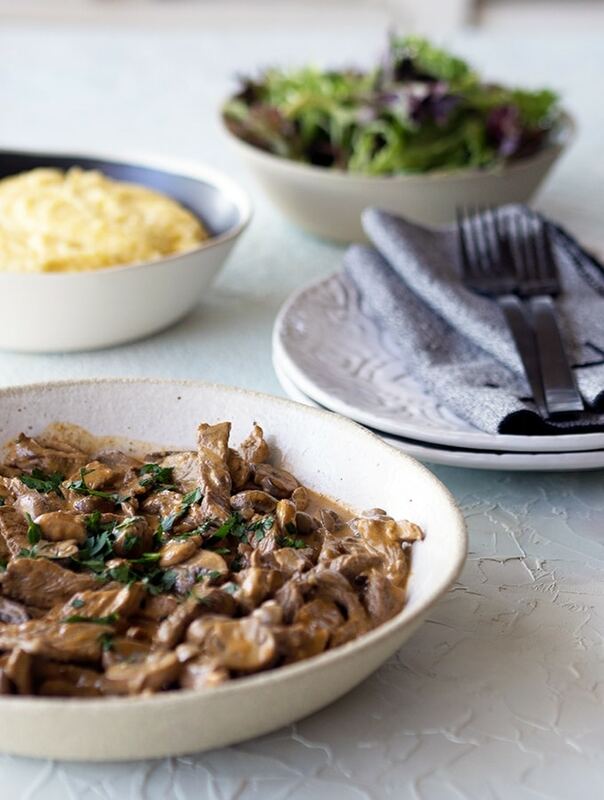 This quick and easy beef stroganoff recipe is perfect to feed your hungry family during the week. It will be deliciously on your table in under 30 minutes. I often get stuck in the rut of a handful of quick and easy go to recipes for feeding the tribe midweek. I have my favourites and none of these recipes are beef based. I will always lean towards chicken or fish. It’s natural, it’s what I personally prefer. The problem is I am not just cooking for myself. The rest of my tribe do like the occasional beef dish. I’m not mean, I don’t cut them off completely until they revolt. There are steaks on the BBQ or even the odd beef roast. It is just those midweek meals that become bovine lacking. 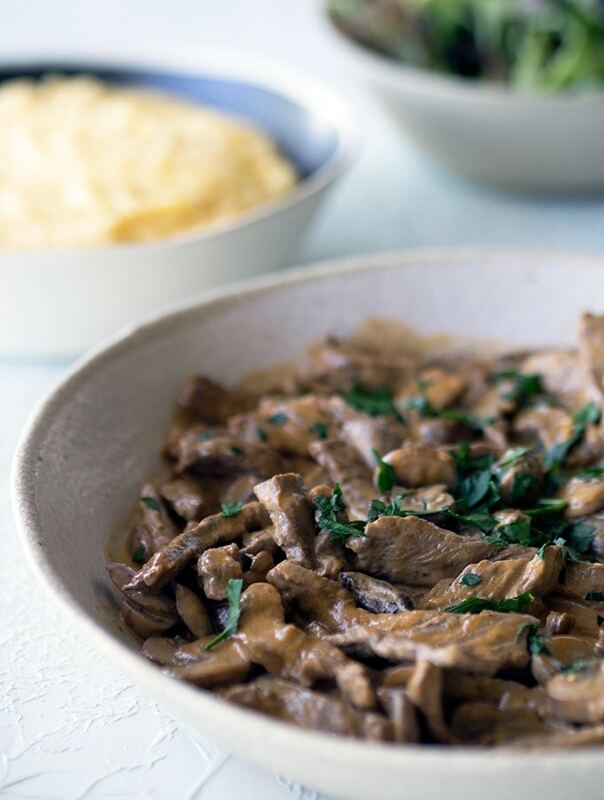 So when I get prodded by the comment “we haven’t had beef for a while”, this quick and easy beef stroganoff is one of my solutions. There is generally some scotch fillet (rib eye) in my freezer. Mushrooms are constant fungi in the crisper and the rest of the ingredients are pantry staples. A creamy polenta is a great accompaniment to this dish. If I am feeling like some comfort food the boys may end up with some fried noodles on the side. Fried noodles? Think cooked spiral pasta, pan fried with some onion in a little butter and olive oil. Cooking it until caramelised crunchy spots start to appear. It really is an unhealthy pleasure. Large non stick frying pan/skillet: It’s a must, if you don’t own one, I strongly suggest you add one to your pots and pans collection. Heavy based is the best. Do not overcrowd your pan with the beef. If you do it will stew and not brown. You want the beef to brown. Browning is caramelisation and that equals flavour. Cook your beef in at least two batches, maybe three if your pan is on the small side. Scotch Fillet: Also known as boneless rib eye. If you would rather use rump steak you can, just be sure to cut against the grain of the meat so your strips aren’t tough. Crème Fraiche: If you don’t have crème fraiche in the fridge or don’t want to pay a premium for it, you can substitute sour cream without a problem. You can read more about the difference between crème fraiche and sour cream here. I doubt there will be leftovers, but if there are you can store them in an airtight container in the fridge for a couple of days. 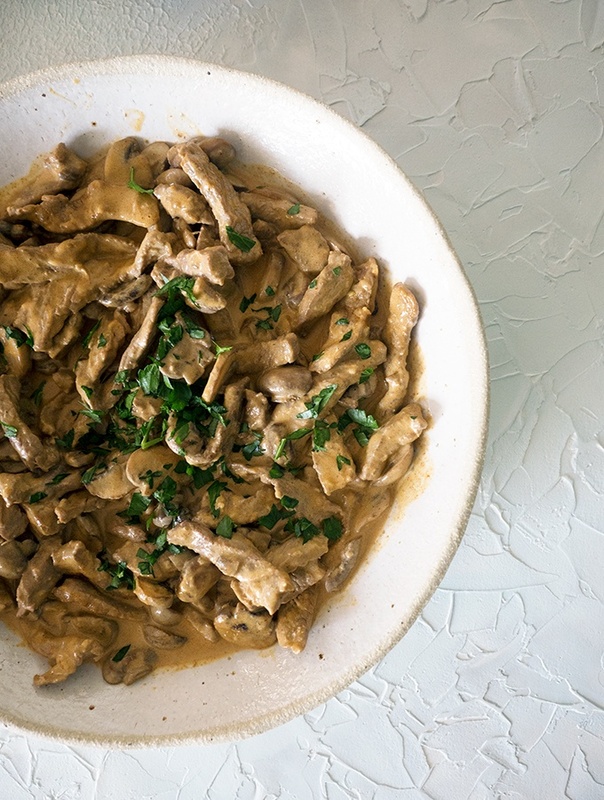 Quick and easy beef stroganoff is great as a take to work lunch. Alternatively, you could freeze any leftovers. You may have worked out by now that I basically freeze anything. Style Guide: Ceramic bowls Kim Wallace Ceramics, Glass bowls Pyrex, Measuring spoons & Serviettes picked up while travelling, Black forks originally sorced from Big W (no longer available). Heat half the oil in a large non stick frying pan. Over a high heat fry half the scotch fillet strips until browned. Remove and place in a bowl. Repeat with the rest of the scotch fillet strips. Add the remaining olive oil to the fry pan. Add the mushrooms and cook for 3-4 minutes. Add garlic and a pinch of salt and pepper. Continue cooking the mushrooms until golden. Add sweet paprika, Worcestershire sauce, cream fraiche, water and any juices that have been released by the resting beef strips. Bring mixture to a simmer and add beef strips. Continue cooking for a further 5 minutes or until the sauce thickens a little. Serve with polenta or noodles and a fresh green salad. This dish looks mouthwatering! Could totally go for some of this for supper tonight! Beef stroganoff is one of my favorite childhood food memories 🙂 My grandmother used to make it a lot! Looks absolutely delicious! 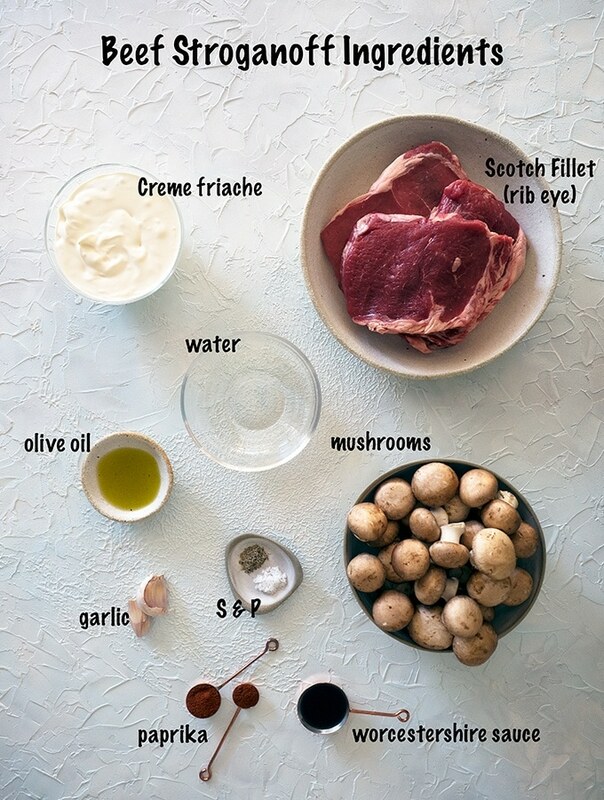 We are big fans of stroganoff but I usually make it with pork, so I will be super excited to try this beef version. I doubt that there would be any left-overs either! This seems like a clean plate club kind of meal to me!